It’s June 1st, so have a happy Donut Day! Your IT staff works hard all year. Perhaps you should consider bringing in a box of a dozen delicious donuts into the office. Some people prefer Boston Cream. Chocoholics are satisfied with chocolate, chocolate dipped. Others love pretty rainbow sprinkles. Or maybe just a simple glazed donut is more of your style. Enjoy your greasy, sugary treats. But donut forget to analyze your network for possible cyber-attack vulnerabilities! It’s vital to scan your systems for malware on a regular basis. But some administrators donut look for unknown files which aren’t on antivirus blacklists. If you donut look for them, the consequences could be terrible – data breaches, ransomware, network downtime, and backdoors for future cyber-attacks. Your business can try a free forensic analysis Malware Scan from Comodo Cybersecurity. Donut forget it! If you donut watch for attack vectors, your business may deal with cyber-attacks you donut want. Sometimes they actually affect the donut industry! Popular Canadian donut chain, Tim Hortons learned a difficult lesson the hard way this past February. Over a thousand locations across Canada found their computer systems crippled, and the impact on their business was direct and painful. Malware entered the donut chain’s point-of-sale network. It made point-of-sale inoperable in many locations, so the affected restaurants couldn’t handle transactions during the downtime. That resulted in a lot of lost revenue and a lot of upset customers who just want a Double Double (a Tim Hortons coffee with two creams and two sugars) and a maple dipped donut. The malware disabled point-of-sale system still ran a version of Windows XP, an operating system that Microsoft hasn’t supported with security patches since April 8th, 2014. Microsoft would urge any and all businesses to run a more recent, currently supported version of Windows. It’s very risky to put an operating system that’s no longer updated on any network. There is plenty of malware that cyber-attackers can buy from the Dark Web that’s specifically designed to exploit Windows XP vulnerabilities in commercially deployed systems. Franchisees are often small business owners and they can’t afford to have to be closed for that long. I live in Toronto, and I often see Tim Hortons franchises with long lineups in the drive-thru and inside of the restaurant. Canadians want their donuts and Tim Hortons is a favorite brand for millions of people. The corporation is responsible for the computer systems that franchises use in Tim Hortons restaurants. Some franchisees threatened to sue Tim Hortons parent company Restaurant Brands International (RBI.) Ouch! Litigation is expensive and can harm a company’s reputation. Great White North Franchise Association represented a number of disgruntled franchisees. A letter they sent to RBI said that the virus caused “partial and complete store closures, franchisees paying employees not to work and lost sales and product spoilages.” The franchises asked RBI for compensation for their losses and explanations for why the cyber-attack happened, how future cyber-attacks could be prevented, and whether or not sales data was compromised. RBI said that no credit card data was breached, but the over 1,000 restaurants certainly lost a lot of money and had to deal with immense reputational damage. A lack of coffee and sweet treats likely left donut holes in consumer confidence. Tim Hortons calls donut holes “Tim Bits,” by the way. You can buy a box with twenty or more of them. They come in almost as many varieties as Tim Hortons’ donuts, as if they were actually cut out of them. But I don’t think that’s actually how Tim Hortons makes them. I’d hate to burst your French cruller! I mean, bubble. French crullers have a light and airy texture because of all of the bubbles in them. Donut let a similar cyber-attack cripple your business! 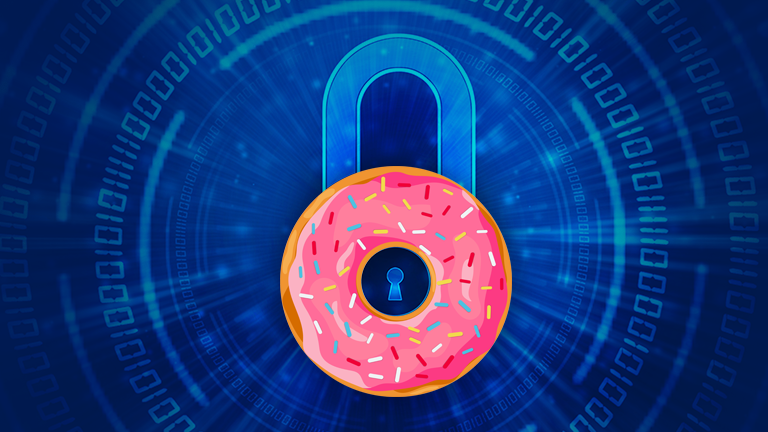 Donut Day is the perfect day to discover malicious and unknown security threats that are lurking in your network. The scan is custom designed for your business’ Windows systems and can be performed in as little as 15 minutes. You may only have to finish your morning coffee and donut to see results. You can try a free forensic analysis Malware Scan from Comodo Cybersecurity today. Cyber attackers donut like to attack your business’ network when you’ve hardened against potential exploits. But you can’t handle your vulnerabilities if you donut know what they are! Mmmm…. donuts.